Vio and Catania had largely flown under the radar of most people in his first 3 and a bit seasons, but it was the 11/12 season that launched him into the spotlight, earning him the nickname “The Little Wizard”. The footage is poor, but it has all the classic hallmarks of a Vio corner: players dragging opponents out to create space, back-post runner and general bemusement from the defenders. An interesting take on Vio’s usual screen technique. Instead of all crowding into the wall, one player simply runs across the wall, potentially un-sighting the goalkeeper. That combined with the fantastic placement of the kick means the keeper has no chance. Surprisingly a pretty generic corner but just goes to show the effect clever spacing of players has from even a simple corner! A very interesting free kick and set-up. The numerous players gathered around the kick-taker forces Lazio to set-up as if the kick will be taken short. 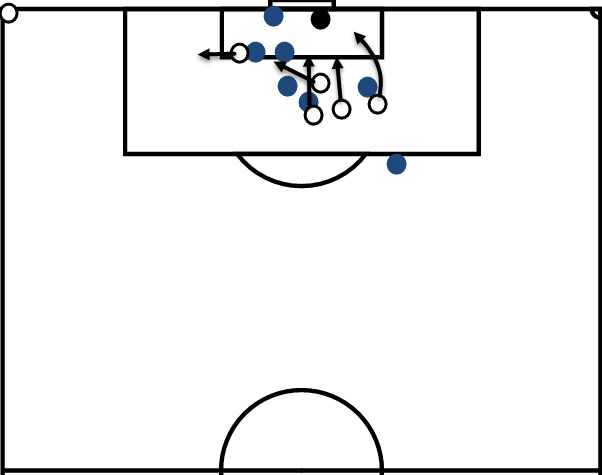 Combined with the 3 players in the box this allows the players on the flank to remain unmarked. The ball is played in to the player on the left, forcing another defender out to defend. 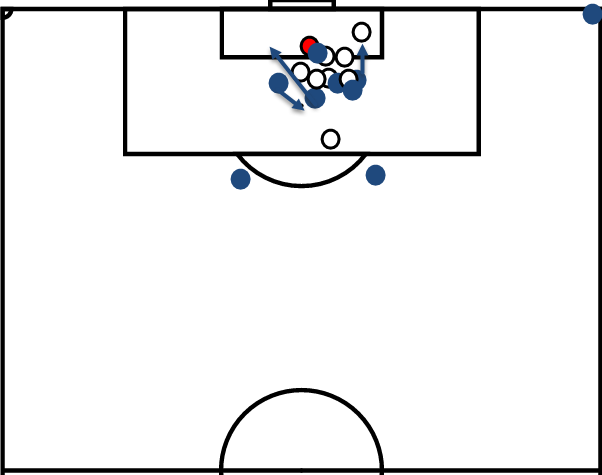 When Catania have numerical superiority in the box, the ball is crossed in. Fantastic routine. Another very clever routine. The runner next to the goalscorer deflects from the fact that the goalscorer has simply side-stepped into all the space that’s been created from the Catania players, leaving the goalscorer in plenty of space for the finish. The “Vio screen” working perfectly. The Catania players create their own wall right behind the Palermo wall, leaving the goalkeeper unable to see the ball until it’s too late. It’s a scrappy finish, but shows the strength of Vio’s corner setups – even if the initial header or attack doesn’t go as planned, there will still be players in dangerous positions who can capitalize from it. Some clever player movement (watch it back again and watch the players interchange from the runs you’d expect them to make) proves to be the deciding factor here as the Roma defenders can’t keep track of which player to defend. A classic Vio chaos technique. The players in the box create space and draw the defenders away whilst the player on the edge of the box signals for the ball and it’s smashed into the roof of the net. Superb finish but a very low quality chance. It looks like Vio has identified the Lazio far post as a weakness in their defensive set-up due to the lack of players marking zonally there – with 2 players man marking the 2 Catania players aiming to attack the back post. The advantage was always going to be with the attackers in this scenario and it pays off with a goal. The camera pans to the box a bit late which makes it hard to analyse what exactly has happened. I’m pretty sure the corner didn’t go as Vio had planned it to go, but the main thing was that a goal was still scored. Players group together and make their runs towards the near post – creating a whole lot of space towards the middle of the 6-yard box and the back post, where 2 players are attacking. As ever though, the players are spaced apart enough that the delivery doesn’t make too much of a difference. The footage cuts the corner a bit late so it’s hard to analyse the movement of each player properly, but from what we can see is some players running to leave the box (can see that from the kick-takers perspective) then turning back and attacking their previous positions. The result is chaos and causes a goal-mouth scramble, but the ball eventually ends up in the net. 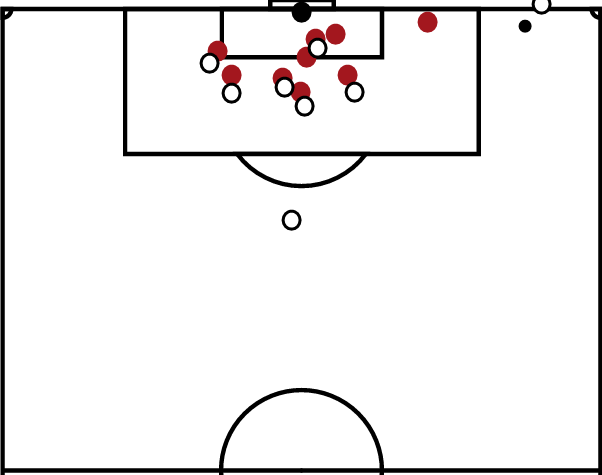 The players in the box drag their markers to either post creating a huge vacuum in the middle of the box, the free kick is played along the ground towards the edge of the box and smashed into the roof of the net by an unmarked runner from deep. Superb routine. 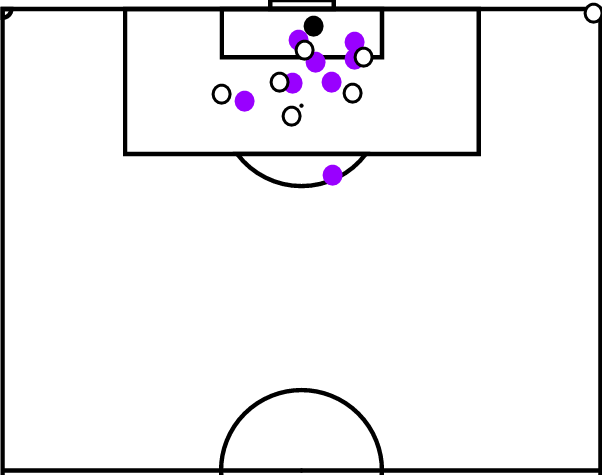 This season was obviously a superb one for Vio and Catania with an incredible 14 goals (27.45% of Catania’s total for the season) coming from corners or free kicks alone. This season saw Vio introduce one new concept in particular – the parting. By getting players in the box to run to both posts, it creates a large gap in the middle of the box for someone to either check their run, or to attack from deep. 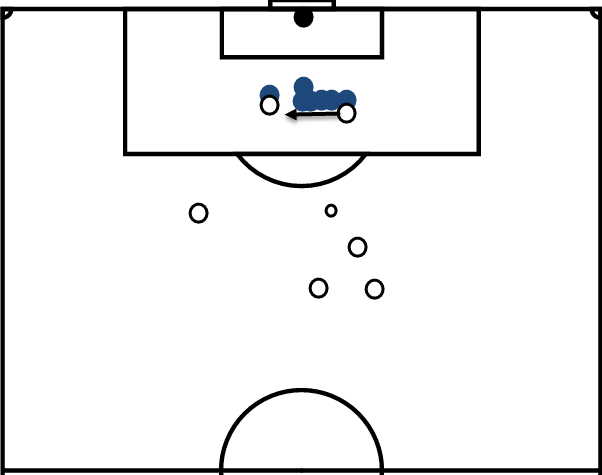 Vio used this method to great effect this season, scoring 3 goals from this alone. The footballing world had now noticed Vio, and Catania manager Vincenzo Montella moved to Fiorentina for the 12/13 season, and took Vio with him – which we’ll explore in part 4.